- Improve lead time calculations, more accurate materials plans and better resource allocation. - The Planning module comprises of Forecasting based on Weighted Average, Multi Level Production Planning, Inventory and Material Planning, Capacity Planning, etc, . Being one of the reputed firms in the industry, we are offering a wide collection of Material Management System to our precious clients. In addition to this, this is an online system to maintain the store and stock of materials in different locations which making easier to trace the details of received and issued materials. 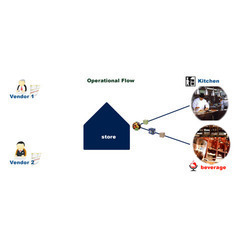 MCS MMS allows multiple departments within the hotel to maintain their stock levels by managing issuing of items from these stores to different departments for consumption with two different cost schemes, FIFO and weighted average. M Cubic Software Pvt. Ltd.
MMS (Material Management System) is an online system to maintain the store and stock of Materials in different locations, making easier to trace the details of received and issued Materials. We offer Material Management System. We are providing Weighbridge Management System to customers. We deal in all types of Material Management System. EmiDMS is a unique Distribution Management System built using mobile app technologies which helps improve the operational efficiency across supply chain. - Android based unique supply chain management solution. - Improves operational efficiency among Distributors, Retailers, Manufacturers and End Consumers. We are providing Material Management System and Material Management Software which is an all purpose comprehensive MMS having additional feature of storage management. All the ratios and timely alerts are generated through the system. The reorder levels when reach the order, it automatically generates as per the options selected. The dead wood is identified and analytical report is presented. This functionality is used to do the requisition for material required during the process. This will show you the required item list , finished and semi finished item list , consolidated required item details etc.